to develop and improve my skills"
Effective English Advisers has been working on teaching foreign languages for more than 25 years. We know about the importance of applying our knowledge of a Foreign Language, especially to those professionals and companies immersed in more and more competitive markets. We therefore offer our clients our solid experience in the business world and a strong methodological and teaching grounding supported by internationally acknowledged Institutions. Our vocation to make the learning of foreign languages an experience of personal and professional enrichment has made us the leading Argentinean company in developing online language training courses, and therefore, be able to offer a new learning approach. (Experiences and recommendations are compiled in Armendáriz, Ana and Ruiz Montani, Carolina; “El aprendizaje de lenguas extranjeras y las tecnologías de la información. Aprendizaje de próxima generación”. Lugar Publishing House). Effective English Advisers counts with highly qualified teachers trained in leading national and international institutions. They all have proven experience in companies and organizations and have worked with us for several years. In addition, our staff is constantly trained, updated and coordinated by Prof. Carolina Ruiz Montani, founder and director of Effective English Advisers. 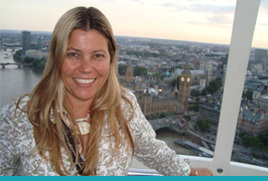 Prof. Carolina Ruiz Montani, consultant in foreign languages for different organizations and developer of this website, has more than 25 years of experience in English and Spanish training courses. Prof. Ruiz Montani holds a degree in teaching issued by the Escuela Normal Superior en Lenguas Vivas "Sofía Broquen de Spangenberg", in Buenos Aires, 1986. She finished her studies and obtained a Certificate for Teachers of Business English at the London Chamber of Commerce and Industry (1998), and a Certificate in e-learning, issued by the Centro Nacional de Educación Tecnológica (CENET,1999). In 2005, she was granted a Bachelor of Arts in English Language by Universidad Nacional del Litoral. Prof. Ruiz Montani published several research works on ICT and Interlanguage applications. She is the co-author of the book “El aprendizaje de lenguas extranjeras y las tecnologías de la información, Aprendizaje de Próxima Generación”. Armendáriz - Ruiz Montani (2005) Lugar Publishing House. Buenos Aires. She has also offered workshops and training courses for English teachers, e-learning and distance learning courses, before becoming a consultant in e-learning, education, and English as a Foreign Language Training. She is a member of APIBA and Argentina Tesol, ESP IS. She has lectured in Brazil, at the Braz-Tesol Convention in Sao Paulo; in Mexico, at the Mex-Tesol Convention in Aguas Calientes; in Prague, at Charles University. In Argentina, she has participated in the Annual Convention of Ar-Tesol in Tucumán; in Buenos Aires she has led workshops on teacher training. She has lectured at UCA in the Annual Conference of FAAPI 2001, and at UCES in the Inter-University Case-Method Seminar for Teachers in 2001. Carolina has been invited to lecture at the TET (Telecommunications for Education and Training) Conference in 2001 and 2007 at Charles University, Prague, Czech Republic.